A view of the Classic Cinema on Dovecot Street in 1972 still bearing its two previous names – the Essoldo and Hippodrome. Built as the Hippodrome Theatre in 1905, burnt down 1932 and rebuilt, renamed Essoldo Cinema 1969 and then Classic in 1972. Chisum and When Dinosaurs Ruled the Earth are being advertised. There was a short film shown along side a showing of STAR WARS about 1981 anyone know the title . YES YOU ARE CORRECT REGARDING THE GANG SHOW – MY BROTHER, PAUL ADAMS, WAS ON ONE OF THE SHOWS. My Mum worked here in the mid 60’s, I was there all the time especially school holdays – think it was here I saw Zulu about 14 times in a couple of weeks! Didn’t we go there for the Gang Show too or was that The Globe? Thank you for this picture, as the Hippodrome Theatre was one of my childhood landmarks. I began my professional career, playing Ronnie in ‘NO ROOM AT THE INN’ with the Harry Hanson Court Players, in 1952 at age 13 in this theatre – paid a full A.S.M’S salary of £4.10s! Played it again in 1963 during a tour of SNOW WHITE, with Ruby Murray. It was then an Essoldo, running films and/or Bingo, and it’s condition came as a nasty shock towards the end of a year’s tour, having played many of the ‘number one theatres.’ When I complained to one of their visiting executives about how dreadfully run-down it was backstage,(cast members often came offstage choking from the dust which descended from the flies after a cloth had been ‘dropped in’, a chunk of broken mirror and a folding table were the contents of my dressing room, plus the fact that when I accidentally dropped my sword, it all-but disappeared through a cracked join in the floorboards!) he ruefully agreed, but said that unless they could get more live shows like ours booked in, they couldn’t convince the shareholders that spending money on the building was worthwhile. Then, sadly, when playing HOT SHOE SHUFFLE at Darlington in ’95 or ’96 (that was a two-year run, so can’t be exact)I drove over to Stockton, intending to video the Hippodrome, but found only a freshly leveled site – timing is everything! So, the job of eradicating my principal childhood landmarks – including Holy Trinity School/ 6 Regent Street, (where my parents had the Ellena Williams Theatrical Studios during 40’s/50’s)/ YMCA Little Theatre, where I first ‘trod the boards’/ Empire/cinema/Odeon and Globe(?) cinemas,etc., – had finally been completed. C’est La Vie! 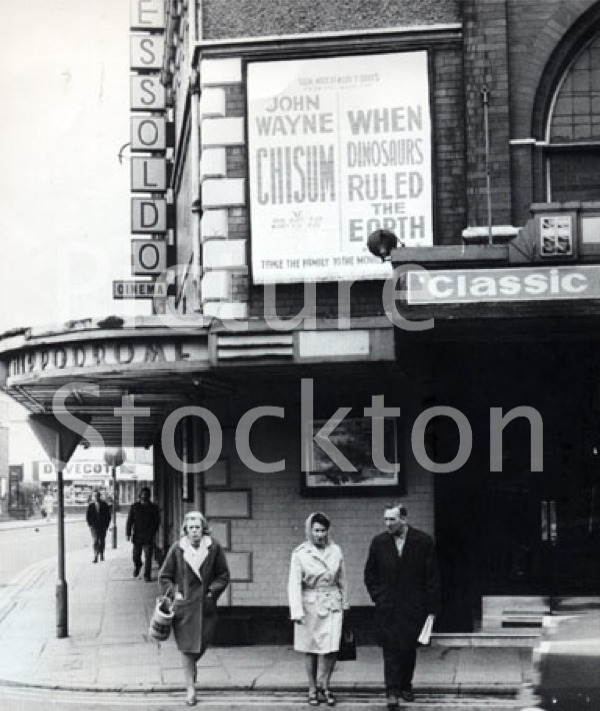 Remember going to the Hippodrome every Friday night with my father, Bert Beard, who worked for Stockton Transport, so we used to get the bus down town and back for free! We used to queue up to go in through a narrow little door fronting onto Dovecot Street, which was only big enough for one person to go through at a time. It was always a variety show, and during the interval I used to get an ice cream tub from the salesgirl, which, I think, we used to have to give coupons for while rationing was still on after the war (Does anyone know when sweet rationing finished? Was it for the Coronation in 1953?) There were no spoons in the ice cream tubs then, you were supposed to fold the lid into a scoop and use that. I was such a fussy person (still am!) that Dad used to have to take an apostle teaspoon in his top pocket for me to use. Harry Iceton – I started Billingham Press as a 15 year old apprentice compositor in 1960 and left in 1967. I too remember Fred Hays and Monica, she was assisted by Joan Shane, Dave Shanes” daughter. I met Ivan Harrington a couple of years ago and he gave me a copy of a photograph he took in the comp. room around 1961/62 before Billingham Press moved to Stockton. I asked him if I could upload it to Picture Stockton but for some reason he wasn”t keen, so I respected his wishes . . . . unless of course you want to change your mind Ivan!